You’re a thoughtful person if you are reading this review. And probably interested in climate change, too, if you’ve wandered here. If you’ve pondered climate change in any depth, you will need to understanding the connection of big events to weather. This book is one of the guides on my climate treks. I turn to it for a better grasp of what’s climate change symptons. These include extreme heat, floods and droughts, our oceans, hurricanes and the like. The book packs almost 500 pages of insight into those climate symptoms and more. And that is just Part 2. Part 1 explains the basics of climate change. Part 3 explains the science. 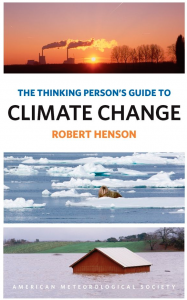 The book continues with insights into climate debates and solutions (Part 4). The book concludes asking What Can You Do? (Part 5) and answers with many ways you can reduce your footprint and work for action. Treat yourself to a sumptuous smorgasbord of thoughts and facts about Climate Change. Buy this book. It is a bargain. It costs only 3 or 4 cents per page. Pages 51 and 205 and many others like it are worth at least 25 cents. Buy it, I’m sure you’ll find many insight. You’ll enjoy many dime’s worth and often quarter’s worth of wisdom.